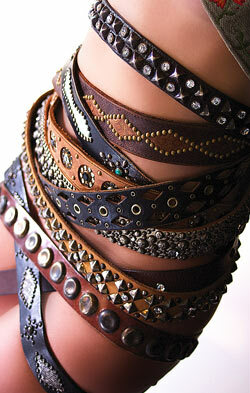 VintageBelts.com works with fabulous designers to craft high-quality, hard-to-find, handmade leather products. The designers in our lineup have a tangible passion for their work, along with a knack for creating cutting-edge yet timeless products that can be handed down for generations. Since its establishment as a sister business to equestrian-based Freedom Eyewear & Accessories, VintageBelts.com has designed hundreds of custom, one-of-a-kind items for our loyal customers. All items are handmade to order, and can take from 2-6 weeks to arrive, with the normal timeframe under 2 weeks. Due to the custom nature of our products, slight variations are to be expected. Feel free to call (619-800-4052) or email us (info@vintagebelts.com) to find our more or discuss your custom needs. And please visit our sister site at www.MagicandSimon.com. Thank you for visiting our site. We love our customers!